Today the children in FS1 and FS2 were so lucky to receive a visit from the cutest baby lamb. She was only one week old and was so friendly with the children. A huge thank you to the Plumstead family for this amazing opportunity. Happy Easter! We invited our favourite cuddly toys in today to join us on our Easter picnic. We worked up such an appetite searching for our Easter eggs that we were thankful for sandwiches, crisps, buns and juice afterwards. Today on Welly Walk Wednesday we went on an Easter Egg Hunt. We took our little Easter baskets we had made on Monday and set off to find some chocolate treats. The Easter Bunny was very good at hiding them- we searched everywhere but we all found one in the end. The chicks were strong and healthy enough for the children to hold them today. We talked about the importance of holding the chicks with both hands and to sit very still so we made them feel safe. 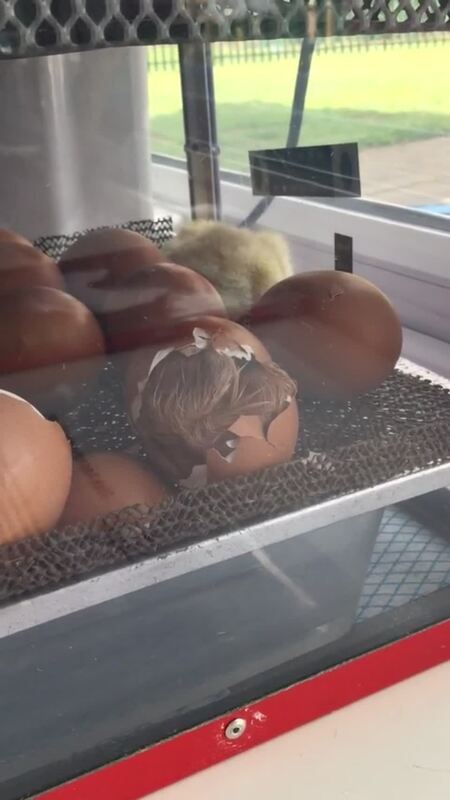 On Friday morning we arrived at school to find our final egg had not hatched properly and a baby chick was stuck inside unable to get out. We had to pull the egg apart to help get the baby chick out but when we removed him from the egg we soon noticed he was very weak, unable to walk and missing half of his fur. The struggle to get out of the egg had caused sores and his fur to be ripped off. We didn't think he was going to survive but we rang the helpline who told us we could try and help our final chick. We had to feed him sugar water through a pipette every hour, leave him in the incubator for 24 hours and bathe his fur and sores regularly. This was a vital lesson to our children who showed so much love, care and affection for our poorly chick and wanted to help in every possible way. By Saturday afternoon our chick was feeling much better and returned to the brooder box with his friends. His name is Lucky. We now have 9 baby chicks in class. We have moved the healthy and fluffy chicks to the brooder box now their fur has dried off. We have made them a bed and provided them with food and water. We think they like their new home! We have named our new arrivals Shimmer, Ginger, Beano, Fluffy and Sunny. UPDATE! We have two new chicks this afternoon, a girl and a boy. We have named them Bingo and Cruella. We had a very exciting surprise this morning when we came to school.. one of our eggs have hatched and we have a brand new baby chick! The children then got to experience one of the other eggs hatching at around 10am this morning. We have to keep them both in the incubator to dry out their fur before we move them to the brooder box. We have a yellow chick which is a boy and a brown chick which is a girl. The children are super excited and we have named our first two additions Chicken Licken and Annabelle. Today we had our eggs delivered for our two week chick hatching programme. The children were very excited as we explained how we would have to look after them over the next two weeks. We talked about the incubator and how it was keeping the eggs warm like a mother hen would and the importance of checking the thermometer to ensure the temperature is right. The children were very careful when looking at the eggs and understood the importance of keeping the incubator very still and safe. Today we planted our own sunflower seeds. We made predictions about how quickly they would grow and talked about the importance of sunlight and water. We also planted some cress seeds on cotton wool. We poured water on one of the cress plants and not on the other and made predications about what would happen. On our welly walk today the children were busy exploring the new signs of Spring around our school grounds. We saw lots of beautiful flowers beginning to grow in colours of pink, yellow and purple. It was a lovely sunny day so we decided to take a trip to the school pond. We were surprised to find heaps of frogspawn floating on the water so we collected some to take back to our classroom to observe over the next couple of weeks. This week we made our own pizzas. We could choose all our own healthy toppings and enjoyed being able to play chefs for the morning. We have really enjoyed watching the Number Blocks series this half term. We have developed our understanding of number and counting as well as numeral recognition. Some of our children have even started learning about number bonds and using the cubes to find the parts to the whole. We even had a competition on who could build the biggest tower and introduced new vocabulary to do with measuring and size. We saw some signs of Spring this afternoon on our Welly Walk. We noticed some flowers had started to grow and the sun was shining through the trees. We laid on the floor in the woods to look up at the sky and observe what we saw. We could hear the birds tweeting and the rustling of the leaves when it was quiet. We have enjoyed learning about the traditions of the Chinese New Year over the last 2 weeks. We have made our own red purses and made the legendary Chinese lanterns. We also got to try some Chinese food as part of our food tasting activity this week. Our favourite was the vegetable stir fry and the prawn crackers! Some of us were even reaching for seconds. We finished off the celebrations with our very own dragon dance in the hall. We had our first bit of snow this morning! The children were very excited so we went out to explore on our Welly Walk. We noticed how our boots crunched with the snow and how we could make footprints and patterns with our wellies! We had fun writing our names in the snow and observing the tracks the cars left behind. We even managed to make a little snow ball and had a fantastic discussion about how it was made. We took it with us to the classroom and made predictions about what would happen to it. We watched as it melted in our warm classroom and talked about why heat made the ice melt. Look at some of the writing our children have been doing in phonics. We have been learning how to form letters correctly! It was a frosty one this morning for our Welly Walk! We noticed patches of ice on the grass and frost on the leaves. It made a CRUNCH sound when we walked on it with our wellies. Our hands and feet were freezing when we had finished so as a treat we had hot chocolate back in the classroom to help warm us up. It was delicious! Over the last couple of weeks we have been learning about Autumn and the seasonal changes this brings. We have had discussions about various woodland creatures such as squirrels, hedgehogs and foxes and talked about how they like living in the woods. As a class we talked about hedgehogs and the conditions in which they like to live. So this week on our Welly Walk we decided to plant a hedgehog house in the woods. The children chose where to place the house based on their knowledge of habitats. We decided it would have to be on the ground as hedgehogs can't climb trees. We talked about how they like the quietness and the darkness of the woods so the children found a suitable spot on our school grounds to place the house. We placed dry leaves inside for comfort and left some food inside to attract potential residents. Thank you to Mr Grace our caretaker for making our beautiful new hedgehog home! The children showed so much enthusiasm and we had fantastic discussions around where it should be placed. This week we introduced the Christmas story to the children in foundation stage. The children loved retelling the story using our dressing up outfits and some of the vocabulary and language being used was fantastic. The children enjoyed taking care of Baby Jesus and dressing as the main characters in the story. Miss Thorpe got her own way this week and Dawn allowed her to put the Christmas tree up in our classroom. Apparently it was too early in November?! The children enjoyed decorating the tree with baubles and tinsel and we all felt a little festive while doing it! Look at this amazing independent writing that we did this morning! It was a wet one this week for Welly Walk! We enjoyed splashing in puddles with our wellies on! We also spent our time outdoors collecting beautiful Autumn coloured leaves. When we got back to our classroom we had an arts and crafts session where we used the leaves to make Autumn wreaths for our classroom. This week on Welly Walk Wednesday we went on a shape hunt around the school grounds. In maths we have been learning about 2D shapes this week so we decided to go outdoors and see if we could spot any shapes in the environment. We noticed that the windows of the school were square, found circles on tyres and had discussions about why squares and rectangles look different but still both have 4 sides. The children were enthusiastic, excited and engaged in learning and showed a fantastic awareness of shapes in the environment. Today we started our Welly Walk Wednesdays in foundation stage. All children and adults got wrapped up, put our wellies on and braved the rain, cold and bluster of Autumn! We looked at how the weather was changing and how the leaves were falling off the trees. We found beautiful coloured leaves like bright yellows, oranges and reds. The children were commenting on various things they were finding such as acorns, chestnuts, pine cones and conkers! Some of the leaves had holes in them and the children suggested that animals may have taken a bite such as insects, caterpillars or squirrels. We talked about how some animals are nocturnal and only come out at night like foxes and owls. The children asked many questions and provided their own ideas and comments as we set off on our Welly Walk adventure. Dawn found a Holly bush and explained to the children how the leaves never go brown like the others- it always stays green because it is an evergreen. Next time we are going to investigate other trees that also might be evergreens. The children collected things they thought were interesting during our walk and we brought them back to the classroom to talk about. The discussion was really interesting and children gained a real insight to the changes of Autumn. This week we have introduced a post office to our role play area. The children have loved writing letters, making cards, sticking, posting and delivering their wonderful creations! This is a fantastic way of engaging children with mark making and introducing them to new vocabulary such as 'stamps, envelopes and parcels' which they may not hear in every day life. The children were making sure they had a stamp on their letter before posting it in the post box and enjoyed wrapping their parcels in string. Today we went on an Autumn walk around the school grounds. We had a checklist of things we had to find such as conkers, pine cones, leaves, chestnuts, fungi and much more. We walked around the woodlands talking about how the leaves were falling off the trees and changing colour to beautiful reds, yellows, oranges and browns. The children thoroughly engaged with the experience and discussed with each other things they had found. We heard vocabulary such as 'crinkly, spiky and crispy' being used during discussions and the children explored the changes of Autumn first hand. The children have enjoyed using the big rolls of paper for their writing this week. Some children have been practising writing their sounds and their name! Providing opportunities like this really motivates children to write and supports the development of those key physical motor skills. The children made a boat out of the large construction this morning during outdoor play. This is a brilliant example of children working together, communicating and sharing ideas. Bubble printing was so much fun! The children enjoyed blowing through a straw to create a bubble effect on paper. As fun as it was we all looked like we needed a bath afterwards- it was SUPER messy! How amazing does our art work look? The simple effects of ready mix and rollers- so much fun too! It certainly brightened up this rainy morning. We have been learning the 'm' sound in our phonics groups. These children independently chose to practice writing this sound on the outdoor chalkboard. Today our children enjoyed experimenting with clay. They used their hands and various construction tools to sculpt their own models. We made snowmen, race cars, boats, castles, princesses- and those are just a few! We loved getting our hands stuck in even though it was VERY messy! Today we talked about the importance of eating fruit and vegetables to keep us healthy. We used lots of different vegetables to make our own tomato soup as our food tasting activity for this week. This week we had a vets in our role play area and the children enjoyed taking on the role of vets and customers. There were some great examples of children playing cooperatively, introducing storylines to their play and engaging in imaginative play based on their own first-hand experiences. We had children using specialised vocabulary such as 'x-ray' stethoscope' and 'bandages' as well as using conversation to act out a narrative. The children have loved taking care of the poorly animals this week and dressing up as vets! This week we had a pizzeria in our role play area and the children enjoyed taking on the role of chefs, waitresses and customers. There were some great examples of children playing cooperatively, introducing storylines to their play and engaging in imaginative play based on their own first-hand experiences. We had children reading menus, showing manners by saying please and thank you and demonstrating their understanding of vocabulary that reflects their own experiences. The language that has been demonstrated in just one area of role play has been astounding. So what better excuse to try tomato pasta this week for food tasting than a pizzeria in our role play area? We watched a video on the big screen about how pasta was made in the factories before sitting down in our own restraunt to eat our pasta! It definitely went down a treat- the bowls were empty and they were asking for seconds! We have loved using our new outdoor water equipment this week. We have been filling containers with the outdoor tap and learning how to use a hose pipe. The children soon found filling big containers with water were too heavy to carry so started using watering cans and small buckets to carry their water instead. They worked together in order to build a flowing water station with one child positioned at the bottom to catch the water in a bucket. The children showed good communication skills throughout in order to work together to achieve their goals, solve problems and overcome barriers. These two girls decided to use the large construction to make their very own tree house. They used planks as ladders to climb inside. Great example of working together and using equipment imaginatively to support their ideas. The children have loved building with our new large construction set. They worked as a team to build a house using the crates and planks to make a square and then lined it with the bricks. This is a fantastic example of children working together, sharing ideas, using equipment, problem solving and playing imaginatively. The language and communication skills the children were using to discuss their ideas were brilliant! "We need to cement the bricks so they stick together"
"That one doesn't fit its too small. Get another crate and we can put it here so it reaches"
"We need to leave a gap here we've forgotten the front door"
WOW! We couldn't believe our eyes on Monday morning when we looked in our tadpole tank. Some of our tadpoles had turned in to tiny froglets over the weekend! They have enjoyed sitting on the rocks the last few days and keep jumping in the water to cool off. We think they're very cute! We would just like to say how overwhelmed we are with the generosity and support of the parents who have contributed to our sponsored fun run. We have raised a MASSIVE £561.10 which we will spend on new outdoor equipment for the children. A huge thank you to all of you- we couldn't have done it without you!! We have set up an environment for tadpoles in our classroom so we can learn about the life cycle of a frog. We collected some frog spawn from our school pond and have enjoyed watching them hatch and grow over the last few weeks. This morning we have some exciting news! Some of our tadpoles have sprouted legs and are enjoying laying on their backs and kicking their newly formed legs. We are excited to see them turn in to froglets now! On Friday 23rd of March in aid of sports relief day the children of Kexborough Primary School took part in a running challenge. As a class we had to see how many laps we could complete in 12 minutes. I would like to say how fantastic the children were at running around our brand new running track! They all tried super hard and on average each child completed 6 laps! For each lap completed we put a pom pom in our jar to measure the amount of laps and look how full it is! Well done to each and every one of you. We couldn't believe it.. the Easter bunny had been! And he had hidden us some chocolate eggs! We spent the next half an hour embarking on a huge Easter egg hunt until we had found them all. We are learning about the Chinese New Year in our class this week so we have lots of fun activities and crafts set up to help us understand how people celebrate it all over the world. Chinese lanterns are made of paper and are one of the main focuses of attention during the celebration as it symbolizes the wish for a bright future. The Chinese believe that while red is a symbol of happiness, gold is a symbol of wealth and these two colours combined bring happiness and wealth for the new year. The dragon dance is a traditional dance form in Chinese culture. The dragon represents wisdom, power and wealth. It is seen during popular festivities such as the Chinese New Year. It's believed that performing the dragon dance scares away evil spirits and all the bad luck associated with them, and brings in good luck and wealth instead. We decided to make our own Chinese dragon in class out of boxes and materials and had our very own dragon dance parade! A popular tradition during the New Year is to give money to children in red envelopes or purses. The colour red is seen as the symbol of energy, happiness and good luck. Sending red envelopes is a way to send good wishes and luck. We made our own little red envelopes with gold coins and wrote our initials in Chinese! Catch it if you can!" It’s Maths, but not as you know it! "Teachers and pupils all over the country enjoy taking part in Number Day. It is a fantastic way to have fun with maths and an opportunity for your school to help fight for every childhood. The money raised at your school will make a significant difference to us in preventing abuse ensuring we can be there for every child who needs us"
Have a look below at some of the fantastic maths work our children were doing last Friday in aid of national number day to raise funds for the NSPCC! Here are all the pictures from our Christmas party! We danced, played party games, ate party food and we even had a very special visitor! It looks like Santa received our invitation after all and he came all the way from the North Pole to visit the children in foundation stage. We hope everyone has a very Merry Christmas and we will see you in 2018! Our annual Christmas activity workshop took place on Tuesday and WOW! What a turnout of parents. The children loved spending the morning/afternoon with their loved ones working their way through various different activities. In foundation stage we really value the involvement of parents so this was a lovely chance to all get together, have a coffee and celebrate Christmas with the children. Thank you to everyone who attended and we hope you enjoyed it! This week in our class we have had a special Christmas post office role play area set up in our classroom. This has provided us with lots of learning opportunities throughout the week. We have been weighing presents, working together and developing our imaginative skills and we even wrote our own letters and posted them to Santa in the North Pole! We also decided to write him a letter as a class inviting him to our Christmas party on the last day of term. We know he's very busy at this time of year, but we thought the least we could do is send him an invitation been as he's probably getting ready to deliver all our presents soon. That's only if we've been good of course! We all helped to decorate our classroom and make it all Chrismassy! We loved hanging the baubles and the tinsel on the tree. Our classroom felt like Santa's Grotto when we had finished. The countdown to Christmas is now on! We even had a special visitor in Monday! We were super shocked to see Pudsey bear walk in to assembly. He came to thank us for all the money we raised for Children in Need! Come back and see us soon Pudsey, we loved having you. Last week was anti-bullying week so the children took part in various games and activities throughout the week to gain an awareness of bullying, but more so, the importance of being kind to others. RETURN OF THE COMPROMISING CHAINS! It is no secret in the world of children that compromise is often a difficult concept to understand. Therefore as part of anti-bullying week the children took part in a compromising challenge. For the challenge the children were paired up and had to wear a paper chain tying them together, which if at any time was broken, the pair would be out of the game. The task required the children to listen to their friends, wait their turn and realise that their wants may not always be immediately met. Halloween has come early in foundation stage! From dressing up as witches and wizards to making wands and casting spells, we've had lots of freaky fun this week! As part of our food technology focus this week we decided we would take part in a fruit tasting activity after the successful vegetable soup tasting session. We had 6 exotic fruits to try including raspberries, mango, pineapple, blackberries, melon and kiwi fruit. The children loved trying all the different fruits and at the end were able to choose their favourite which we will be presenting in a class graph during maths. We talked about the importance of eating fruit to keep us healthy. Last week in class we made vegetable soup as part of our healthy eating focus. We chopped carrots, onions, leeks, potatoes and turnips and made our very own class soup out of it. It tasted so yummy we even went back for seconds and thirds! We have been learning about the season Autumn in our classroom! We went on an Autumn hunt where we found fresh berries, conkers and pine cones. We talked about how and why the leaves change colour to brown, reds and yellows. We even went leaf collecting as they blew off the trees and used them for printing and art activities. A warm welcome to all new children and parents starting foundation stage this academic year! The story we have been focusing on this half term is called 'Whatever Next'. It's the story of a little bear who finds a cardboard box under the stairs at his house and uses it as a rocket to get to the moon. He embarks on his adventure, meeting a little owl on the way, and together they travel to the moon for a picnic! We loved this story so much we based some activities around it. From bear crafts to lunchbox designing, healthy eating discussions to having our own picnics on the moon- we had so much fun exploring space and learning about the planets in our solar system! We also thought it would be a brilliant idea to bring in our own favourite bears from home. We used our imaginative skills to think about where we would like to take our bears if we could take them on an adventure! From Lego-land to the supermarket for Jam sandwiches- our class proved we can take our imaginations every where! This week we were celebrating Easter, and had a fun-filled week from start to finish! We had lots of fun Easter activities set up indoors and outdoors and enjoyed learning about the traditions of Easter. We made Easter baskets, Easter cards and Easter buns too, finishing off with an epic Easter egg hunt on our last day! We really enjoyed writing letters to the Easter bunny this week! This week in FS1 we have placed a huge emphasis on the three areas of communication and language: listening and attention, speaking and understanding. We have engaged in various activities throughout the week to develop in this area including reading and retelling stories, asking questions, making cereal for a friend and lots more! We opened a cereal bar in FS1 this week! The children took part in a speaking activity and chose a partner to serve cereal to. They had to ask questions such as asking their partner what cereal they would like and whether or not they want milk. S.54a- Uses talk to ask questions. Our traditional story of the week was 'The Three Billy Goats Gruff'. The children worked in groups of 4 to read the story of the Three Billy Goats Gruff. They listened to the story, used the props to retell it and then engaged in a discussion about the characters, giving their opinions and listening to others. LA.42a- Listens and attends to a dialogue in a small group of 3 or more children. Last week in FS1 we celebrated world book day by engaging in various activities throughout the week. Each class was able to choose a book as a focus and in FS1 we chose Mr Wolfs Pancakes! In the story Mr Wolf wants to make some pancakes but finds it difficult to complete tasks such as reading a recipe, writing a list and cooking the pancakes on his own, so he calls on his neighbours for help! His neighbours in the story happen to be other popular traditional characters such as Little Red Riding Hood, Chicken Licken, The Three Little Pigs, The Gingerbread Man and Wee Willy Winky, however not one of his neighbours will help Mr Wolf to make his pancakes. Mr Wolf struggles to complete all the necessary tasks throughout the story, however manages to make lots of yummy pancakes all by himself. The story then takes a slight twist, as all Mr Wolfs neighbours want to eat some of his delicious pancakes, so Mr Wolf is stuck with a dilemma- should he share his pancakes or take another approach and teach his selfish neighbours a lesson? The children in FS1 loved the story of Mr Wolfs Pancakes and we based lots of fun activities around the story during that week. Luckily, last Tuesday was pancake day, so we took on Mr Wolfs task and made our own delicious pancakes! We wrote our own recipe lists, made our own pretend play dough pancakes and used props to retell the story. We even explored some of the original character stories such as The Three Little Pigs and The Gingerbread Man! We also took our learning outdoors to build a brick house for the Three Little Pigs to live in! In FS1 we read stories every single day including topical books, our Pie Corbett reading spine books and traditional stories. Last week we were focusing on one of favourites- Goldilocks and the Three Bears! During the week we decided to turn our home corner in to the Three Bears House providing open ended role play opportunities for all children. We also had a huge emphasis on rhyme, alliteration and tongue twisters. Our tongue twister of the week was 'She sells sea shells on the sea shore'. We had lots of fun trying some of them out! We also linked various other areas of the curriculum to our story of the week. We learnt various skills throughout including re-telling a story using props, acting out a narrative, matching numeral to quantity, counting, baking with oats, writing for a purpose, using the language of size and of course, learning to love reading! Last week in FS1 we had a real emphasis on Maths, particularly on measuring and comparing different quantities. We started the week by filling and emptying different sized containers, saying which size held the most and which size held the least. It wasn't long before the children were using this mathematical language in their independent play! We also played around with the idea of weight. The children were introduced to a balancing scale, and had fun trying out different objects to see which one was heavier or lighter than the other. We also realised that everything has a weight, therefore during baking some of the children were using prediction to say which of the ingredients felt heavier than the others! The children were able to say which items were heavier, lighter and learnt that when the objects are of the same weight, the scales will balance! We also learnt how to compare amounts of objects by saying which pile has the most and which pile has the least. We played games, made buns in the play dough, compared animals, said which object was bigger/smaller or taller/shorter and most importantly learnt some key mathematical language while having fun with measurements! Last week in FS1 we changed our home corner to a role play Café! The children loved finding their roles as either head chef, waiters/waitresses or customers. The language the children were using in their play demonstrated their understanding of their past experiences. Over the last couple of weeks we have been learning about animals that live in really cold places. We have looked closely at animals that are found in Antarctica, and looked at what they need in order to survive! We even had our very own Antarctica small world! We also spent the afternoon building habitats for our favourite polar animals using the construction and various materials. We also used a computer program called 360 cities to explore the Antarctica for ourselves! We loved reading all about the animals that live in the cold weather! We read a collection of fiction and non-fiction books to help us learn all about the polar animals. We even wrote them letters and drew them pictures to send to the Antarctica. At our Christmas party we were all joined by a very special guest! We were super lucky as he brought a present for every single one of us! And then we had lots of party food! We had worked up quite an appetite dancing and playing all of those party games! This week in FS1 we have been learning about the season Autumn. We have had lots of Autumn themed activities to get involved in this week. The children have learnt about hibernation as well as taking part in leaf printing, farmers market role play, conker maths, vegetable soup water play, leaf rubbings and we even had a visit from some elves and fairies who moved in to our small world pumpkin house! Not to mention we made our very own vegetable soup on baking day, made our own hedgehogs out of clay and went on an Autumn hunt for beautiful leaves, conkers and pine cones! We would like to say a big thank you to everyone who donated today and wore their spots to support children in need. In our class alone we managed to raise £36.50- much needed funds for a brilliant cause! Thank you for your support- we all had lots of fun! This week in school was anti-bullying week so we've been super busy taking part in different tasks in order to support friendship and kindness to others. For such a young age group, us adults were in shock by what we saw! The children were listening to each other, discussing what they would like to do, and even stood waiting patiently for their partner while they had a snack! Some children found it difficult to compromise and therefore their chains had to be broken, however overall the children showed outstanding motivation and dedication to compromising with their friends. We also talked about what friendship means to us throughout the week, engaging in lots of different friendship activities including making a sandwich for one of our friends, and painting a picture of someone who is kind to us in our class! So last week we had some very unexpected snow! We couldn't resist getting our hats, gloves and wellies on and going for a play outside in the snow. We were soaking wet from all the snow balls and snow angels- not like we noticed- we were having way too much fun! Last week was bonfire night week in the Busy Bees classroom and we had lots of fun activities set up for us to do to ensure we had an explosive and colourful week! We talked about all the excitement and traditions of bonfire night, and most importantly, how to stay safe around fireworks whilst still having fun! Getting our 'art attack' on! We used a paint spinner to create wonderful explosive firework pictures! We had lots of fun bonfire night activities to do last week, including pastel drawings, explosive firework maths, firework patterns, bonfire art work and lots more! We even made parkin buns on Wednesday as part of our baking. Last week in FS1 we celebrated Halloween! We talked about the traditions and customs of the event and engaged in lots of spooky activities! We had so many learning opportunities throughout the week as well as having LOTS of fun! The children were busy trying to spot some Halloween characters in our outdoor environment! They were using clipboards and pens to record how many they could see! From interactive pumpkin carving on the big screen and reading pumpkin stories, to using shapes to design our very own on the light box- it's safe to say we had lots of fun with pumpkins last week! The children loved making wands out of natural resources! And glitter of course..
Not to mention they found turning each other in to frogs quite enjoyable! We also had perfect potions, slippery slime, dirty dough and haunted houses!